Our dog, Baxter, is very much a part of our family. Sometimes I think he runs the house. I do know the little fella is big on attitude. As a member of our family, his nutrition is just as important to us as our own. Purina® Pro Plan® does just that… it provides our dog with the nutrition to be his absolute best, helping him to be energetic and resilient, and maintaining an ideal body condition, healthy skin, and a stunning coat. 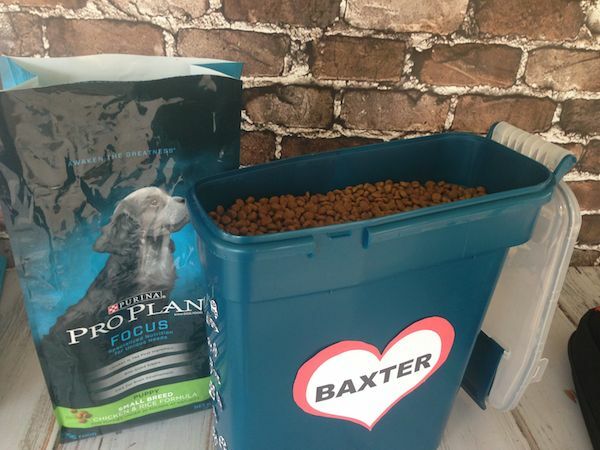 I had an appointment the other day and while I was out I stopped at PetSmart to pick Baxter up a bag of Purina® Pro Plan® Focus dry dog food. I wish I could have taken Baxter with us, but since I couldn’t take him to my doctor’s appointment, I had to go without him. I love shopping at PetSmart because everyone is so friendly and helpful and anything and everything you need for your pet can be found there. 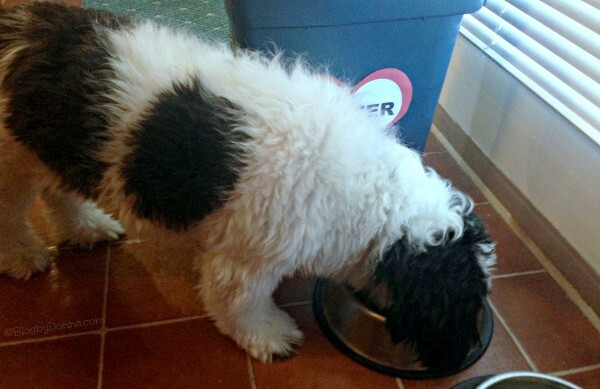 Our dog is 17 months old and has always eaten Purina® Pro Plan® dog food. He did start off eating wet dog food, but we quickly transitioned to dry. It just works best for him. For a little dog he has always had a healthy appetite and Purina® Pro Plan® Focus for Puppies Small Breeds is the perfect dog food for him. Our vet suggested we continue with “puppy” food until he is 18 – 24 months old (we’ll soon be giving him Focus for small dogs). His favorite is the chicken and rice formula. You want to find the formula that is right for your dog. You can always ask your vet which Purina® Pro Plan® dog food he recommends will provide the best nutrition for your dog. 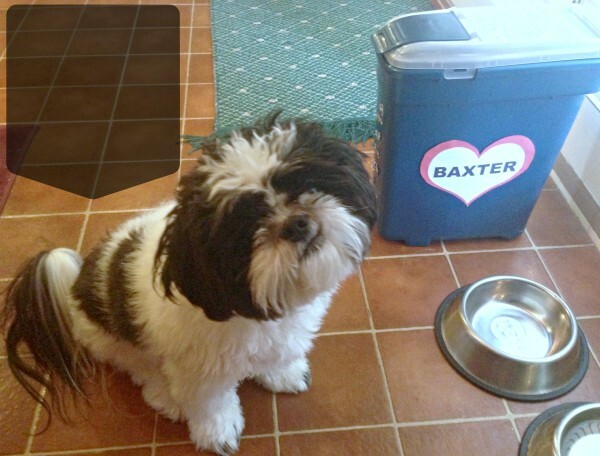 Since Baxter is so special to us, my son thought his food storage container should be personalized. I made a couple of printables that you can download for free to use to decorate your dog’s food storage container, if you’d like. Although you can’t see his eyes in this pic… I love this face! It’s really easy to do, just find a container big enough to hold the size of dog food you normally buy. The storage container we have is perfect for Baxter. It holds a bag of dog food, which lasts him about a month. Since he is a small dog, he doesn’t eat a huge amount. Plus he gets 2-3 treats a day. Okay, sometimes more. Click HERE for dog bone printable, HERE for Paw Prints printable, and HERE for Hearts printable. 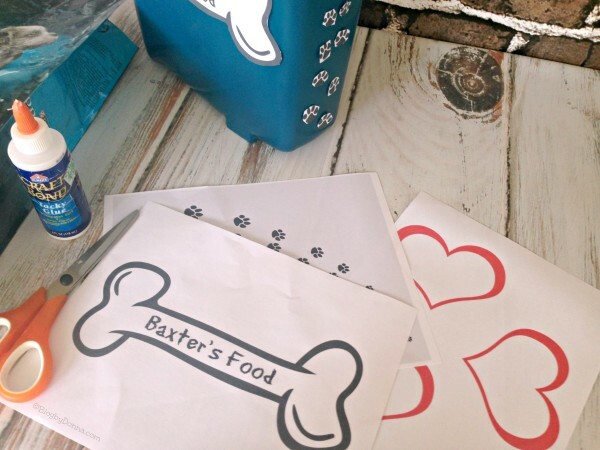 My son printed out the printables and grabbed a pair of scissors and glue and decorated Baxter’s storage container. I do recommend a storage container of some sort for your pet’s dry dog food, because it will keep the food dry, fresher, and any creepy crawlies from getting into it. Baxter loves his food storage container and it made my son feel good to do it for him. Baxter is a very loving dog. He is funny as can be, loves to run, and run, and run, until he just collapses. And when he rests… he does that just as much vigor as he does running and playing. 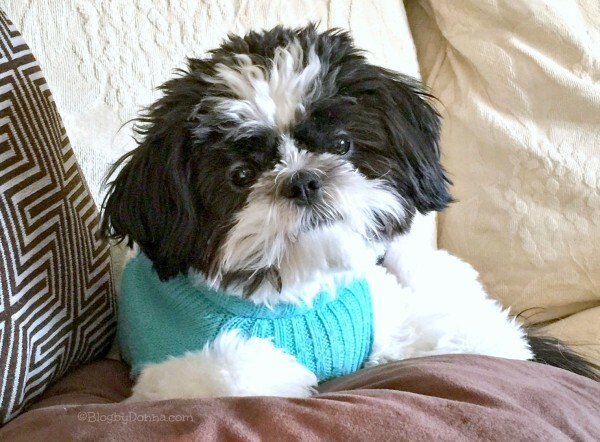 Baxter is a healthy happy pup and we plan on keeping him that way with the help of Purina® Pro Plan® providing him with good nutrition, making sure he gets adequate exercise, and just loving him. Visit the Purina® Pro Plan® MyPLAN website to get your dog’s MyPLAN recommendation and a rebate offer for a free bag of Purina® Pro Plan® Dry Dog Food (4-6lbs, up to $18.99.) Good only in U.S.A. A.P.O’s, F.P.O’s. Void where taxed, prohibited, restricted. Allow 6-8 weeks for shipment. LIMIT ONE REQUEST PER INDIVIDUAL, ADDRESS, or EMAIL ADDRESS. Offer expires 04/30/2015. See full terms. You can connect with Purina® Pro Plan® on Twitter and Facebook. 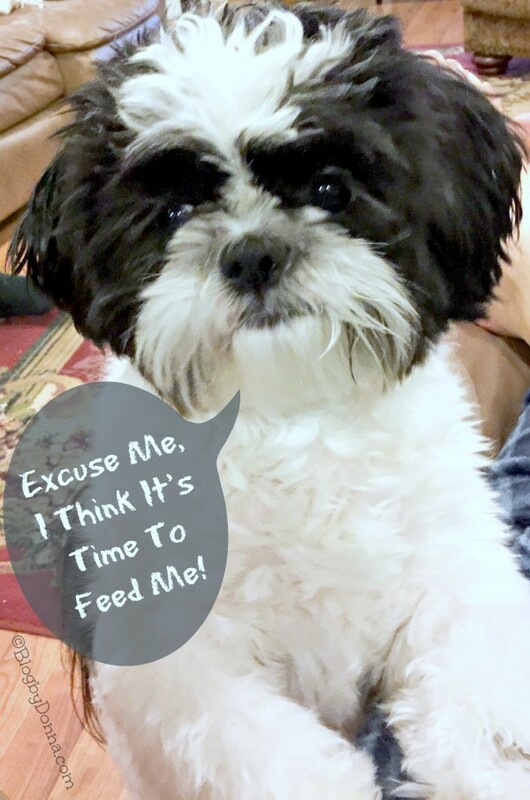 Do you have a dog food storage tip? I am going to have to pick some of this up for my dog, Milo! I bet he would love it. Baxter is the cutest! My vet told me that Pro Plan is a really good over the counter food. Our dogs just love Purina dog food. They go wild for it. This sounds like a great dog food. I have bad allergies so I don’t have any pets. Aww what a wonderful little dog you have. It’s great that you’re able to treat him with a great dog food like Purina. I’ve heard nothing but good things about Purina One. I might have to pick some up for my guys. Awwwwww Baxter is so cute! We have a storage tub with a lid that we use for the dog food. I have a large dog, 9 year-old boxer and a small 2 year-old dog, Tink the chug. She has to have little bites food. Baxter is ultra adorable and seems both loved and spoiled. I am definitely going to use that printable for our Harvey! your dog is adorable. I really ant a dog, but we need a fence first. How could you not take the best care of him? That face!! Our pets were on a diet version of their food, but since they are so old my husband argued that they deserve the “good” stuff. I guess I’ll be eating well when I’m old too. Good choice. Just an adorable furbaby you have there. Sounds great! 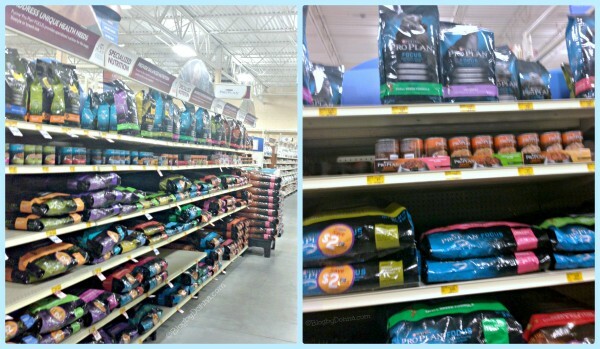 My dogs are on ridiculously expensive dog food. I’m talking $25 for the smallest bag. I should Check this out! What a cute dog! I go with the Purina Pro Plan too! Baxter is just the cutest thing. I recently upgraded my cats’ food to some better quality stuff, its so much better for them. Our pet are very much a part of our family. We take as good of care of them as we can. Baxter looks so cute! He looks like doggy royalty! Glad to see you take such good care of him! I love your little fluff! He is so cute! 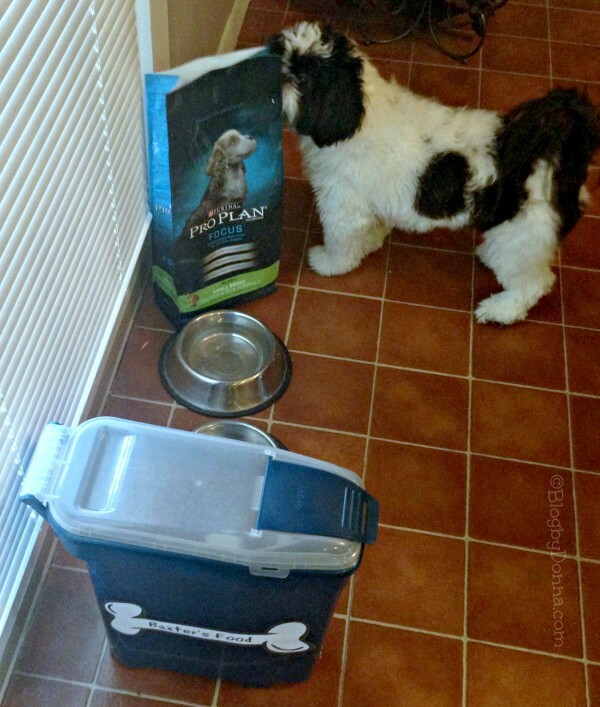 Looks like he loves ProPlan too! Your dog is sooooo adorable! I love the bone you made to decorate the container. Your dog is just the cutest. Purina has always been a great pet food brand. I heard Purina was a great brand. No doggie but I think yours is adorable! What an adorable dog! Sounds like you made a really great choice! Baxter is adorable. I have a big container i use for my pet food. It is such a cute idea to put the name on it. Your do (and the adorable sweater) sure look happy! We don’t have a dog, but it sounds like this is certainly the best food to be using. Never tried the proplan, but looks like a winner as your doggie attests! I think these are great advice! I love my dogs (the oldest being 14) and definitely want to make sure that he lives to his full age! Baxter looks pretty content with what he is eating. Purina is a good brand. 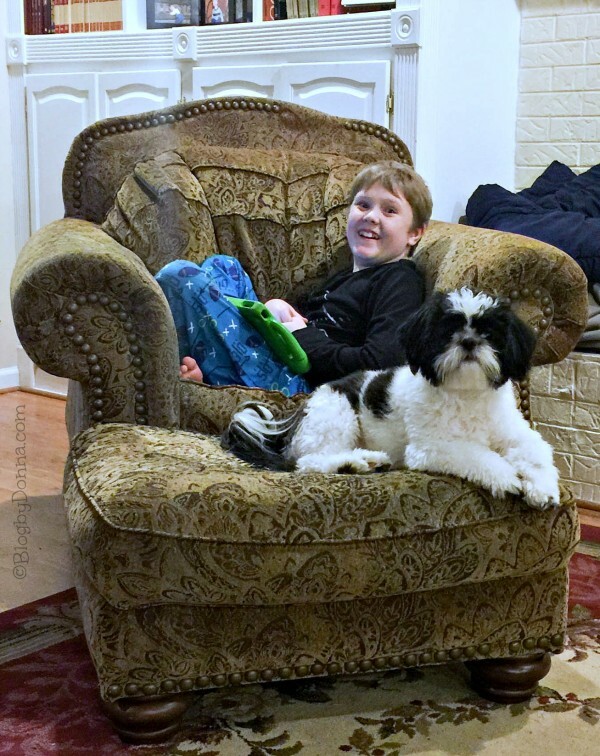 Yeah, he’s a happy little camper… loves his Purina Pro Plan for sure. I just store my dog food in a child-locked shelf. Baxter is a good name for a dog.